A long time ago there lived an old lady in a small house. She lived in a small house. The house was located in a small village. The name of the village was Panakaon. The Grandma was a poor old woman. Her daily activity is only in a small house. She had a dog and a mango tree. In the fruit season, all her mangoes were taken by the villagers. Whether men, women or old people, all of them stole her mangoes. One day, an old man came to grandma's house. He asked while trembling, "Can you give me some food? I have came here because of hunger/I'm very hungry." Grandma was looking at the old man and felt a lot of pity for him. So, she gave him a plate of food and drinking water. "Nah, this your drinking water and this is my leftover food from yesterday," said the grandmother. After the old man ate, he said, "Thank you very much for giving me drink and food. Now, ask whatever you want and I will give it to you," the old man said. "Well," said my grandmother. "It's my mango tree. During this fruit season there are people who are going to pick my mangoes from the tree. So my request is whoever comes to steal my mangoes will be stuck in the wood and will not to be missed." That's all you request?" said the old man and he vanished from sight. In the morning, the villagers come back to steal the grandmother mangoes. 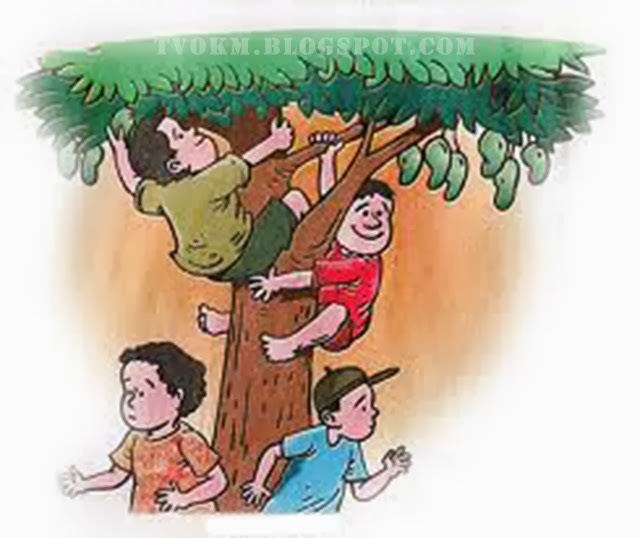 After the thieves touched the mango tree, they immediately stuck to the bark and no longer move away. The birds which perched in the tree also stuck. Goats and chickens also stuck after they touched the tree. When the old grandma saw the scene, she started yelling. "Nah, you taste these days. I told you not to steal. Right? I will poke you all." Grandma let the old man stick to the tree until sunset and then she released all her captives. "Now go back home. Don't do this again. If you ask me for mangoes, I will give them to you," said my grandmother to the thief. Since then, no one has dared to steal grandmother's mangoes. They get permission from her to pick them.